Biware, the developers of the extremely popular Mass Effect franchise have revealed the trilogy compilation pack to be released on November 6,2012. Mass Effect has been a very successful franchise in the gaming industry and with the new Mass Effect Game in development and the new Omega DLC, a lot of people will be excited to have a compilation pack coming out. Bioware will be bringing the original Mass Effect to the PlayStation 3 for the very first time. Regarding the original Mass Effect, Bioware has decided to release it as a stand alone title for the PS3, through the PlayStation Network. The original Mass Effect was released for the Xbox-360 and then for the PC, but never for the PlayStation. Mass Effect 2 released initially for Xbox-360 and the PC but was later released for the PS3 as well. 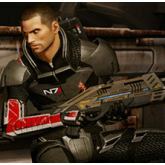 Mass Effect 3 launched for all platforms on March 6, 2012 and a Wii U version will be coming out on November 18,2012.